On this page you will find my original works of writing including op-ed articles, poetry, stories, and essays. Check back here throughout the year to read some of them. Here’s to 2017 being a year of inspiration! Thank you for visiting the ‘Travel’ section of Girl Off Paper. Stay tuned for recommendations, pictures, and stories from trips I go on throughout the year. Upcoming segments include a visit at Western State Colorado University in Gunnison and my senior trip to London! I look forward to experiencing lots of new people, places, and things in 2017 and I can’t wait to share these travels with you! The first thing you should know about The Love That Split the World by Emily Henry is that I read it in the span of about five hours. That could just be because my pleasure reading schedule up until this point in the year has been largely nonexistent, but truthfully, I really did like the book. The Love That Split the World is a mish-mash of sappy teen romance, folklore, science fiction, and magical realism all set in a small Kentucky town. It sounds like a lot to handle, and at times it is, but something about the novel kept me flipping pages like nobody’s business. The story begins when the main character, Natalie Cleary, comes into contact with a “figment of her imagination” who she calls Grandmother, after three years of shutting the hallucination out. Throughout her life, Grandmother has told her stories in the form of Native American folklore and other religious legends, up until the point Natalie goes through therapy and rids herself of Grandmother’s presence. However, upon Grandmother’s return, she tells Natalie that she has three months to save an unknown male, and that everything she needs to know is in all the stories Grandmother has told her over the years. What follows is Natalie’s search for the mysterious boy she has to save, her journey towards figuring out what is causing her strange visions, and an angst-y romance complete with a couple of existential crises along the way. 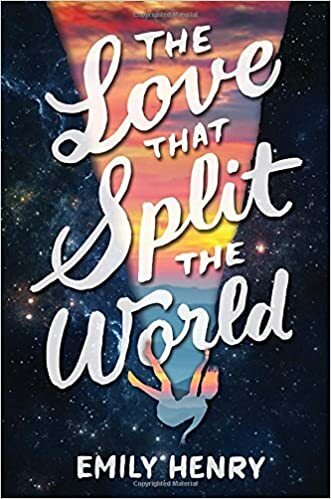 The Love That Split the World explores time travel, parallel universes, legends and folklore, the theory of soul mates, and the drama of high school relationships all in one book. While the story does become fraught with cliches as it goes on, it is the perfect read for people recovering from more academic literature (AKA me). While I would not count it as one of the greatest books I have ever read, the story fascinated me and kept me interested enough to finish the book in one day. I may be a little biased: I like sappy romances and alternate universes and folklore and mystery. But a lot of other people do too. So, if you are looking for a quick read before the time comes for all of us to go back to school/work, The Love That Split the World may be the book for you. For some of you, seeing the “Relationships” tab on my blog might be a little surprising. At the moment, I am as single as can be, so what do I have to say about relationships? The answer is: plenty. In short, I love love. I am a sucker for rom-coms, weddings, cheese-y teen relationship novels, and public displays of affection. Love is a part of the human experience, whether it is between friends, significant others, or families. I am lucky enough to be surrounded by lots of it, so this is the place where I would like to celebrate that. It is my vision that when everything is said and done, this page will be filled with fun date ideas, segments about couples that I admire, a look at love among friends and families, lessons I learn about love over the course of the next year, and hopefully a couple of hilarious date stories. If you have any ideas you would like to submit, please do! Cheers! Like most other high school students, I recently got through first semester finals. And believe me, I am ecstatic that they are finally over. The stress of finals is nearly inevitable, and I am definitely still recovering from all of that studying. Luckily, the library at my school was equipped with coloring books and relative quiet in order to stave off student anxiety, but even that wasn’t enough for me. I have never felt so scrambled, unsure, frazzled, and nervous than I was during the last couple of months of first semester of senior year. For quite some time, I went through the school day with a persistent knot in my stomach and a lump in my throat. I couldn’t imagine how I could get through so many assignments, violin practices, club meetings, and family events every day. And something about it struck my fancy. I have always been a fervent list-maker and lover of stationary. What could be better than combining both lists and stationary in a way that could actually help me keep track of everything going on in my life? It almost sounded too good to be true. So, I dug around in my mess of a room for a fancy notebook my boss had given me and set myself up to begin journaling. With a wide variety of pens and my browser opened to my Pinterest page, I started by making an index, a key of symbols, and a year-long calendar. It was oddly therapeutic to give everything I would be putting in the journal a symbol, and was even more calming to resign myself to the task of designing my calendar. It was then that I began creating monthly logs, a series of pages in my journal dedicated to laying out all the things I had to do each month. Everything that seemed to be piling up on me was a lot less threatening when it was laid out in a linear fashion. From there, I broke down the events of my life even further into segments of daily logs. I began to record everything I did during the day. Not only did this get me to reflect on how I had spent my time, but it also showed me that I was actually getting stuff done, even if it felt like I wasn’t. Of course, I also added in some fun pages, like my Senior Year Bucket List and a list of self-care ideas. And the journal keeps growing. I’ll admit, I’m not the most artistic person in the world, so my journal is more simplistic than most. I do not spend a lot of time on cute doodles or particularly intricate lay-outs, though I would like to change that. I generally use it to plan, relax, and muse on different ideas. Bullet journaling has become like a form of therapy for me and, as nerdy as it sounds, making all of those lists is kind of fun! The tasks set before me immediately become much less daunting after I file them away in one of my lists, and nothing feels better than checking an item off once it has been completed. In a time filled with college applications, scholarship applications, homework assignments, orchestral pursuits, and maintaining some degree of a social life, my bullet journal has become a necessity. I would recommend bullet journaling for anyone who needs some clarity in a hectic lifestyle, especially students! If you have a bullet journal, I would love to hear some of the ways that you use it. If not, try it! You will not regret it. Hello and welcome to Girl Off Paper! I am so excited to share aspects of my travels, writing, education, and every day life with you. I decided to start this blog in order to express myself, de-stress, and create something that is completely and utterly me. On paper, I am an eighteen year old girl, a (mostly) straight-A student, a college applicant, a daughter, a sister, and a violinist. Off paper, I am a dreamer, a change-maker, a planner, a thinker. I can’t wait to use this site to show that. I hope you get some use out of Girl Off Paper as well: a laugh, a lesson learned, or an idea, perhaps. Please enjoy!